The Atlanta Braves saw prospect Ronald Acuna jump up national prospect lists this season. What’s in store for his future? The Atlanta Braves signed Acuna from Venezuela in 2014 for the “light” sum of $100K. He opened 2015 with the Gulf Coast League and after 37 games, he hit well enough to show he was ready for time with Danville in the Appalachian League. His overall line was .269/.380/.438 over 237 plate appearances with 4 home runs and 16 stolen bases. He posted a 28/42 BB/K ratio, good for an 11.81% walk rate and 17.72% strikeout rate. There was a lot of buzz about Acuna in the offseason, and even more so in spring training as people began to throw around Andruw Jones comparisons to Acuna’s skill set, which is an impressive guy to be compared to, especially in the Atlanta system who knows what young Andruw looked like. Acuna started out in Rome in the full-season South Atlantic League, an impressive assignment for an 18 year-old. He hit well out of the gate before a thumb injury derailed his season on May 9th. Acuna returned to action on August 22nd in the GCL for rehab and returned to Rome on August 26th to help with a playoff push that resulted in a South Atlantic League championship. On the season he hit .312/.392/.429 combined over 179 plate appearances with 4 home runs and 14 stolen bases, posting a 19/29 BB/K ratio. Over the winter, Acuna participated in the Australian Baseball League. He was part of 20 games with Melbourne, posting a .375/.446/.556 line with 2 home runs and 13 stolen bases, along with a 10/13 BB/K ratio. Acuna is listed at 6′ and 180 pounds. He could be a hair taller than that and maybe as much as 15 pounds heavier, but those numbers look fairly close. He has a very athletic build, with plenty of muscle on his frame, as lean as he is. Contact (50) – If there is any area of Acuna’s game that could use some refinement, this is it. Acuna has a bit of a long load to the hitting zone in his swing. He stands tall at the plate until the pitch is delivered and has a low leg kick to get into hitting position. Acuna has tremendous bat speed through the zone once the bat enters the zone, so once he’s gotten the bat into the zone, he’s got plenty of ability to make impactful contact, but he does sometimes struggle to get his bat into the zone, especially on premium velocity. While that could be a bad thing for Acuna as a future leadoff hitter, he certainly has the skills needed to be a .260-.280 hitter annually, which, with his power, would be plenty to be an impact middle of the order hitter. Power (60) – Acuna has not hit for a ton of home runs in his minor league time so far, and many sources, looking at his statistical output have labeled Acuna as a “speedster”, painting the image of a guy who’s a slap-and-punch hitter. That’s about the furthest thing from the truth. The video above is from David Lee, who writes for Baseball Prospectus and scouts frequently in the South Atlantic League. There may not be a bigger fan of Acuna than David, and he’s been quick to say that Acuna’s power is by far his loudest tool. Right now, I have him as a 60 only due to the fact that he’s showing that power in batting practice so far, not in games, but Acuna has explosive strength in his swing from his lower half and hands/wrists that should lead to plenty of power as he matures, even bumping this grade up a full grade. Eye (60) – For a guy with a longer load, Acuna does have a very solid idea of the strike zone, and he’s been able to keep his strikeout rate in check, which is fairly impressive with the swing he has. He’s also not just avoiding strikeouts, but Acuna does do a nice job of laying off pitches and working counts in order to work up a pitch count as well, forcing a pitcher to make his best pitch rather than getting out on an “easy” one. Speed (60) – While I mentioned that Acuna really shouldn’t be classified as a “speedster” due to bringing much more to the table, that doesn’t mean that he isn’t fast by any means. While his raw speed is fairly impressive, the incredibly impressive thing about Acuna is his natural instincts on the base paths, both in stealing and running. For a player who was just 18 last season, he showed tremendous instincts on when to and when not to steal, though he did struggle a bit with that initially coming back from the injury. 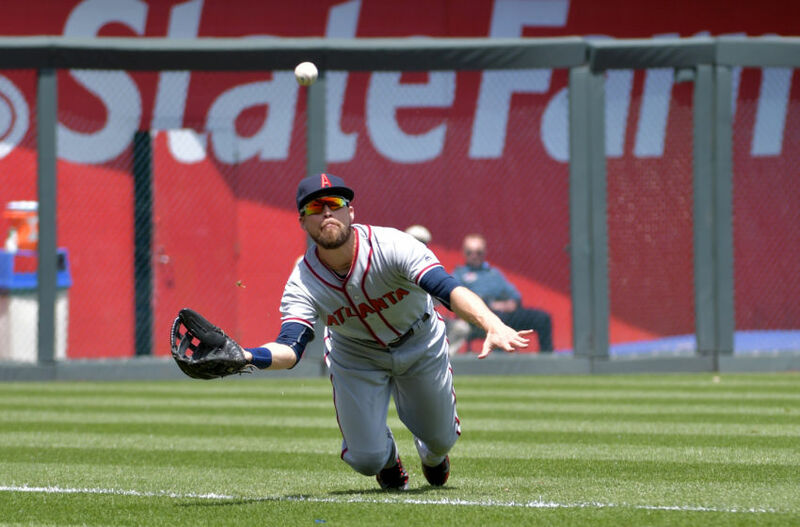 Defense (55) – Acuna uses his speed well on defense right now as well, but in the outfield, he has a lot of natural, raw talent in center field while a guy like Ray-Patrick Didder was showing very natural feel for the position. 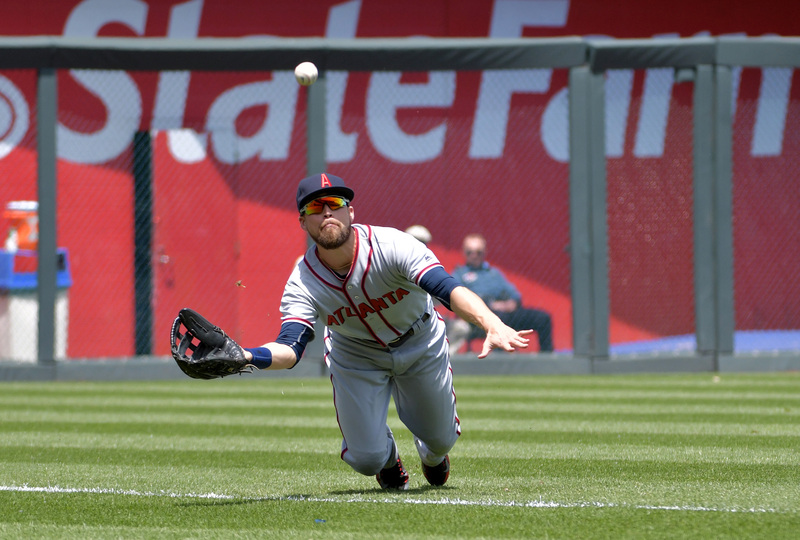 Acuna’s working on becoming a natural center fielder rather than an athlete that is playing center field, but that could take some time, and with some big time defensive center fielders in the system already in Didder, Cristian Pache, and, of course, Ender Inciarte at the big league level, Acuna may find himself playing a corner, where he would likely be elite defensively due to his athleticism. Arm (55) – Acuna has a fringe-plus raw arm strength, but I did note that he had some issue in getting himself set on each catch for the best position to throw the ball upon receiving the ball. 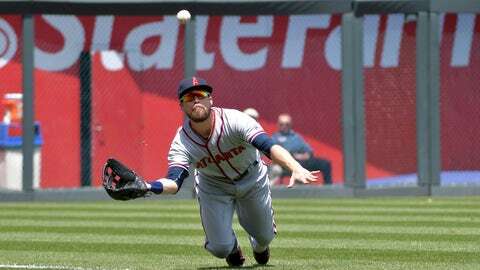 While that is just a little thing, it’s part of that still learning his natural feel in the outfield, and it did have his arm play down some as there were multiple times I noted a runner tag up that likely would not have if he was behind the ball on the catch and in excellent throwing position. While people have mentioned Andruw as a comp for Acuna, I do think that is getting a bit ambitious, especially on the defensive end. I looked at their similar size, similar BB/K ratios, percentage-wise, and similar proclivity to power, and really feel like an excellent future comp for Acuna is Curtis Granderson. While that may not excite some people as an elite name to throw out there, it’s good to remember that Granderson has put up just shy of 44 fWAR in his career with three seasons of more than 5 fWAR in an individual season. He did put up some padded-number seasons in the short porch in New York as a Yankee, but Granderson has been an excellent performer throughout his career, and while it has fallen off significantly after some injuries during his Yankees time, Granderson was once known for high-level center field defense as well. Acuna will likely open the season with the Florida Fire Frogs, and it’s very likely that’s where he finishes the season as well as the team looks to get him a full season of plate appearances at one level. However, it would not surprise me in the least if Acuna made the leap to tap into that power further, and my Granderson comp is even under-selling him in a year. If he can do that, it would not surprise me if he’s a top-10 prospect in all of baseball!